Utah Division of Wildlife Resources | Ready, aim, take ’em! 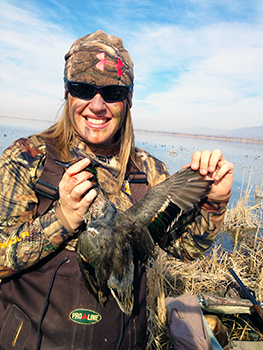 Here's the story of my very first duck hunting adventure. ALMOST EVERYONE AT the DWR’s Salt Lake office knows I’m a new hunter. So far, I’ve hunted pheasants, deer and turkey. I tend to go around visiting folks in the office to rant and rave about my hunting adventures. Because of this, I have no hesitation begging avid hunters to take me along on their hunts. Thursday! YES! I’m in! My first duck hunt was in the works and preparation commenced. Because my good friend Robin Cahoon, Legislative Liaison for DWR, is also new to hunting and wanted to check duck hunting off her list, I secured her a spot on the trip too. We spent the rest of Wednesday gathering supplies, duck stamps, hunting permits, HIP numbers and everything else everyone told us we needed for the hunt. 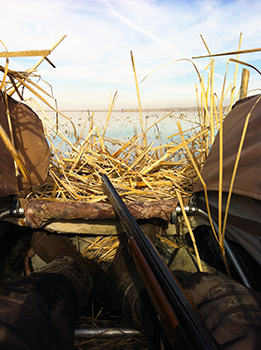 My view from the blind at Farmington Bay WMA. Thursday morning, up and at ‘em. I didn’t get much sleep Wednesday night because I was way too excited. We decided to meet at Farmington Bay around 9 a.m. Robin and I arrived first and decked ourselves in face paint, which was so much fun! Rich arrived and we loaded up the gear and headed out. We put the boat in and headed to our spot. Rich brought reinforcements, Chad and Dave. Dave was also a new hunter. Robin and I set out decoys while Rich unloaded most of the other gear. 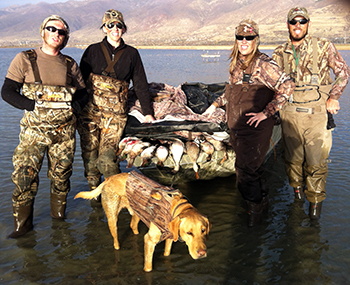 We had small decoys, big decoys, swimming decoys and flying decoys. There was a lot going on in our little area. Rich had these really cool blinds for us to lie down in during the hunt. We stuffed cattails and grass in and on the blinds to help disguise them from the birds. Once they were good and hidden, we climbed in and got ready. Rich told us he would say “ready” when the birds were coming in, and this meant we needed to prepare our guns and get ready to shoot. He would then say “take ‘em,” which would let us know we could bust out of our blinds and take a shot. I was so anxious and excited sitting in my little blind, I could barely contain myself. Anytime a bird came anywhere close, my heart would race and I’d start wiggling. Rich and Chad used different calls to attract the birds. It was a good mix of a lot of different sounds. You could see birds change directions in flight in response to the calls. Very fun to watch. Here I am, proud as can be, holding my first duck. My first shot of the day was…well, interesting. We saw a bird coming in and when Rich said “ready,” I busted out of the blind and started shooting. I couldn’t help it! I was so excited I just went into motion. I busted out shooting and on the second shot, the bird went down. Everyone was yelling and I was still in shock that I actually hit the dang thing. Thor, Chad’s bird dog, retrieved the bird and Chad handed it over to me. Robin and I did a little dance and pounded fists in excitement. We shot a total of nine birds: one for me, two for Robin, three for Chad, one for Rich and two for Dave. Chad and Rich were quite the gentlemen, letting us take most of the shots throughout the day. Dave was another newbie so he was blasting away like Robin and me. A group shot with our harvested birds. I was sore and tired the next day, but I had so much fun — it was worth every ache and pain. I’m grateful to know such kind, fun mentors willing to take out a newbie and show me the ropes. I’m also lucky to live in a state where there are so many great hunting opportunities throughout the year. If you’ve never been hunting, ask your neighbor, friend, cousin, uncle, aunt or granddaddy to take you. If you’re anything like me, you’ll be hooked on the experience and the chance to create lasting memories. My next hunt is already in the works. There’s more to come from this new hunter!